Carnegie Mellon University’s Joel Tarr, who has spent his career studying the environmental history of cities and the history and impact of their technological systems, was awarded the 2015 Distinguished Service Award by the American Society for Environmental History (ASEH). The ASEH gives the award each year to an individual who has contributed significantly to the development of the organization. Tarr received the award at the society’s annual conference in Washington, D.C., on March 21. Caroline Acker, head of the Department of History in the Dietrich College of Humanities and Social Sciences, said that the field of environmental history is on the rise as issues like climate change and global warming take on urgency. She believes Tarr's work has been critical. 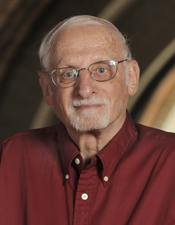 “Joel was a pioneer in environmental history that brought cities into environmental studies. Environmental history is one of the most dynamic areas of history today and Joel's research into the infrastructure development that knitted cities into systems is one of the reasons,” Acker said. Tarr, the Richard S. Caliguiri University Professor of History and Policy in the History Department, has additional appointments in the H. John Heinz III School of Public Policy and Management and the Department of Engineering and Public Policy. A CMU faculty member since 1967, he has received numerous other honors, including the Society for the History of Technology’s Leonardo da Vinci Medal. The society's highest honor, the da Vinci medal goes to an individual who has made an outstanding contribution to the history of technology through research, teaching, publication and other activities. He also received CMU’s Robert Doherty Prize for Educational Leadership in 1991. Tarr has served on National Research Council committees dealing with issues of urban infrastructure, public transit and water pollution. He was president of the Public Works Historical Society in 1982-83 and president of the Urban History Association in 1999. For more information on Tarr, visit http://www.history.cmu.edu/faculty/tarr.html. Joel Tarr (pictured above), the Richard S. Caliguiri University Professor of History and Policy in the History Department, has spent his career studying the environmental history of cities and the history and impact of their technological systems.